With their latest masterpiece, EPICA set new standards. 2016’s The Holographic Principle is the most epochal, multi-layered, courageous and successful record of the band, reaching top 10 chart position entries in the German, Dutch and Swiss album charts. Accordingly, all the tracks written for the album process are high-quality, but not all songs have been put on the album. "This is only based on the fact that the record should not exceed 76 minutes," explains Mark. Since the band didn’t like the idea of a double CD, they finally decided to release an EP with six brand-new numbers, which were created during the creative phase of The Holographic Principle. Said and done. 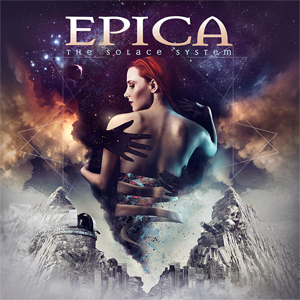 Today, EPICA, proudly announce their upcoming long-awaited EP, The Solace System! It is scheduled to be released on September 1st, 2017 via Nuclear Blast. "The listeners can expect a high-quality EP - with songs that are far too good to use them only as bonus tracks. We wanted to publish these songs together in a context. It is always hard to decide at the end of a recording process which songs will be on the album, because this means that you have to miss some songs with best quality, just because they do not fit quite well into the overall flow of the record or because there are other songs that are more suited to the lyrics." So much the better then that EPICA have chosen to publish those songs in an EP. Due to this EP, no one has to miss these damn strong songs that, just like the album, consist from a contrasting versatility, equally opulent, bombastic moments, as well as filigree emotionality! This is proven in the new music video to the title track "The Solace System" produced by anime-master Davide Cilloni, which you can see on KNAC.COM HERE. And if that wasn't enough, you'll be also able to purchase the new EP The Solace System together with the CD of their recent studio album The Holographic Principle as a box set! It will be called The Holographic Principle – The Ultimate Edition. Get your physical copy through the EPICA Webshop HERE or directly from Nuclear blast HERE. Or get the digital version and receive the title track "The Solace System" instantly. And there is some more good news! Nuclear Blast is going to re-release two ancient albums of EPICA, Design Your Universe and The Divine Conspiracy, on vinyl on August 18th. Each album is available in two different colours, the pre-order has already started last week. In support of their upcoming EP The Solace System, this Fall EPICA will head out for their ULTIMATE PRINCIPLE TOUR to the North America in August/September with LACUNA COIL, INSOMNIUM and ELANTRIS.